Max Büsser has certainly been a busy boy. This year alone, he announced the Final Edition of the HM3, the robot clock Melchior, the LM101 Frost, the all new HM-X, and the Arachnophobia Table Clock. Quite a handful of products for a small, independent company like MB&F. But he is not done yet. Today (Nov 3, 2015) he announced yet another new watch. 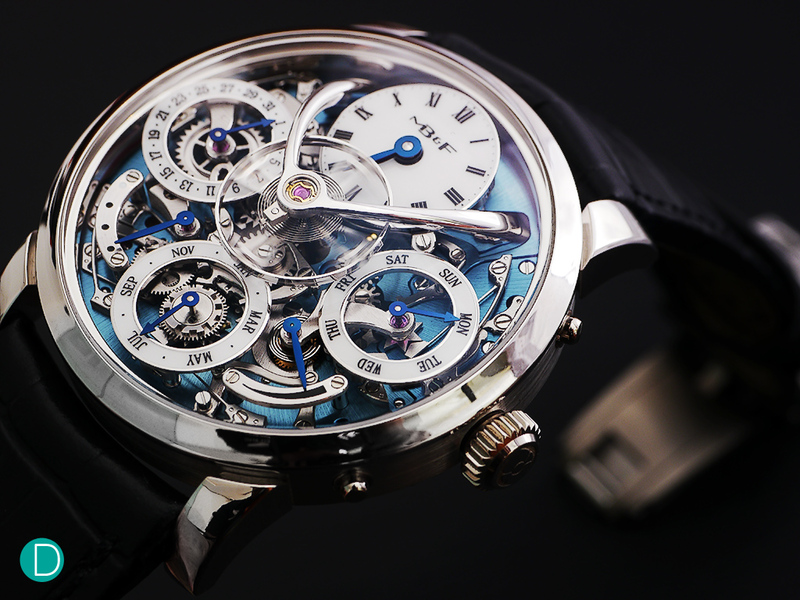 The MB&F Legacy Machine Perpetual. The MB&F LM Perpetual: dial detail. Shown as in MB&F’s teaser released over the weekend, but zoomed out just a little bit. 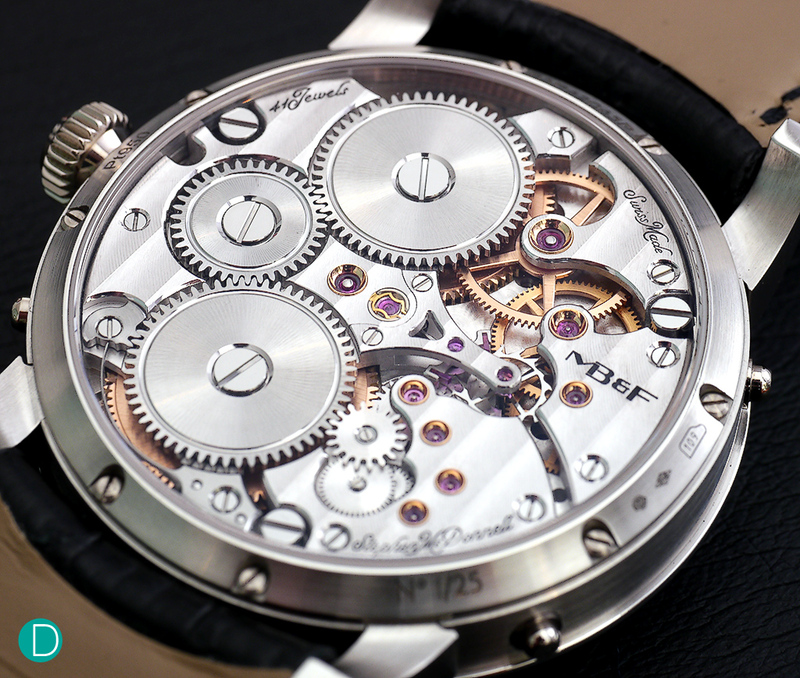 Handsome good looks of the MB&F LM Perpetual. The color combination as well as the placement of the subdials visually interacting with the balance bridge with its suspended balance wheel. First impressions on seeing and handling the watch is extremely positive. We only managed to photograph the platinum version which you see here, with the gorgeous electric blue dial background. 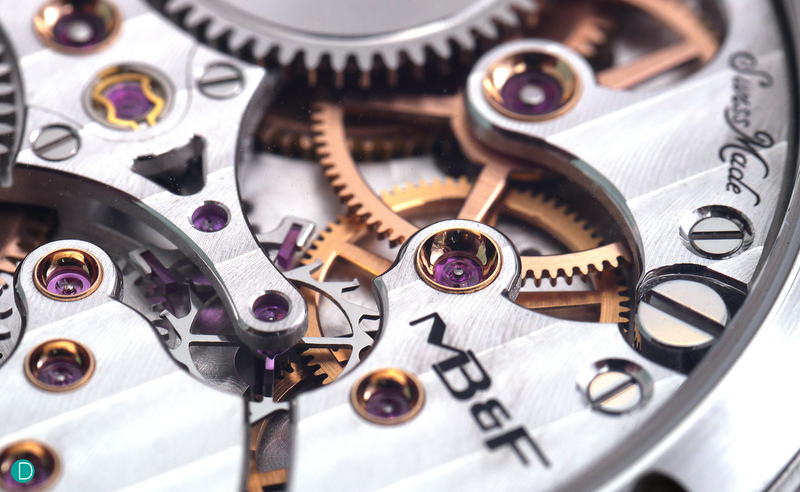 MB&F have used this color combination before, also to great effect. The blue and white is very pleasing to the eye. The red gold version has a dark grey dial background, and the balance wheel has a golden hue, and we did not see or handled it, but from the official MB&F photographs, looks lush with a touch of romanticism. MB&F LM Perpetual in platinum. Also available in red gold. Each limited to 25 pieces. Made to a limited edition of only 25 pieces in red gold and 25 pieces in platinum. The perpetual calendar is a classical high complication. 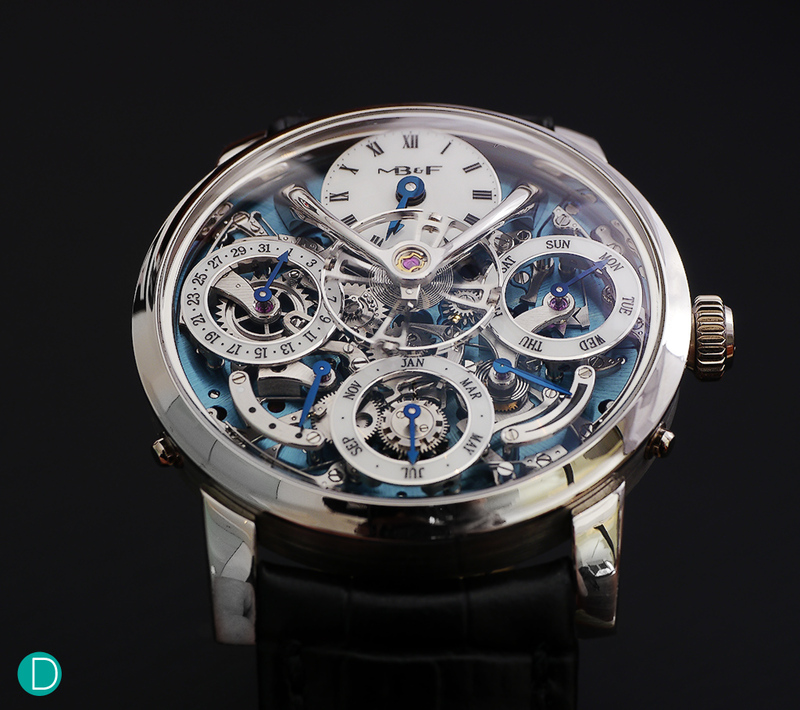 As mentioned, the Legacy Machine series is MB&F’s so called classical line. But it is still a very modern take at the classical, taking the traditional design cues, and perhaps stretch it to its limits. To these pair of old eyes, the LM series still look rather avant garde. The signature suspended balance which seems to be unconnected to the rest of the movement train is a signature of the LM series. As are the subdials which appear to float above the dial. Anyway, it seems a bit ho-hum for MB&F to just insert a perpetual calendar into its classical line. And we have certainly not known Max to want to do anything ordinary. So on to the extraordinary! 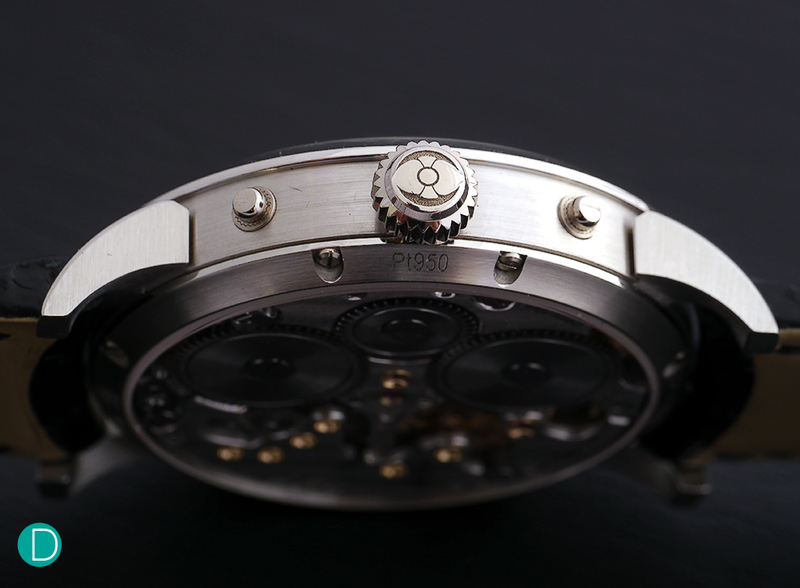 The design signature of the LM series is the suspended balance and the sub-dials which appear to float. Keeping this signature proved to be an impossibility with the traditional and classical perpetual calendar, and a new perpetual calendar system have to be developed. To understand, we need to explore the classical perpetual calendar to see how the MB&F Team solved the problem and managed to keep the design signature giving rise to a new perpetual calendar system. The classical perpetual calendar is typically a perpetual module in the form of a movement plate mounted on the dial side of a standard movement. The indications are synchronized by a big lever (French grand levier) which runs across the top of the complication and passing through the center. As the date changes the lever conveys the information to the complication components moving it forwards and back. This presents a special consideration. The lever runs through the center of the movement and requires full access across the dial. This means that no other complication can be placed over the center as it would interfere with this movement of this lever. This places significant constraints on the classical perpetual calendar and gives rise to the familiar dial layout. Also, in a traditional grand levier system, the perpetual calendar assumes that each month has 31 days by default. And through a 4 year disc, the mechanism is able to “know” the months which have less than 31 days, and skips through the superfluous dates to the 1st of the new month. This changeover can take from 10 minutes up to several hours. During the Y2k changeover from 31 December 1999 to 1 January 2000, we observed several perpetual calendars from 11:30 pm on. Some of the calendars would only complete the changeover at 3 am on January 1. Any manipulation or adjustment during this changeover can damage the mechanism. The classical system does not even allow the calendar to be reversed, as most of the indicators were designed to move in one direction. Doing so would jam the mechanism, requiring a trip back to the atelier to be re-adjusted. Early attempts to re-think the classical perpetual calendar began with the Ulysse Nardin Perpetual Ludwig in 1996. This was probably the first perpetual calendar which allowed the owner to use the crown to manipulate the calendar display. Here Ludwig Oeschlin re-imagined the perpetual calendar using a system of planetary gears, which allowed the calendar system to be adjusted at will in both forwards and backwards directions at all times. Even during changeover. See an explanation on how it works on Timezone.com here. And an experiential review from an owner at Purists.com here. Later, H. Moser renewed the idea with their Perpetual 1, with what they call the Flash Calendar. This allows the calendar display to jump directly and instantly from the end of the month to the first, without fast forwarding through superfluous dates between the last day of the month (which may be 28, 29, or 30 depending on the month) to the 1st. The Flash Calendar also allowed manipulation of the calendar display in both directions and at any time the owner wishes, the display instantly jumping forwards and backwards when doing so. 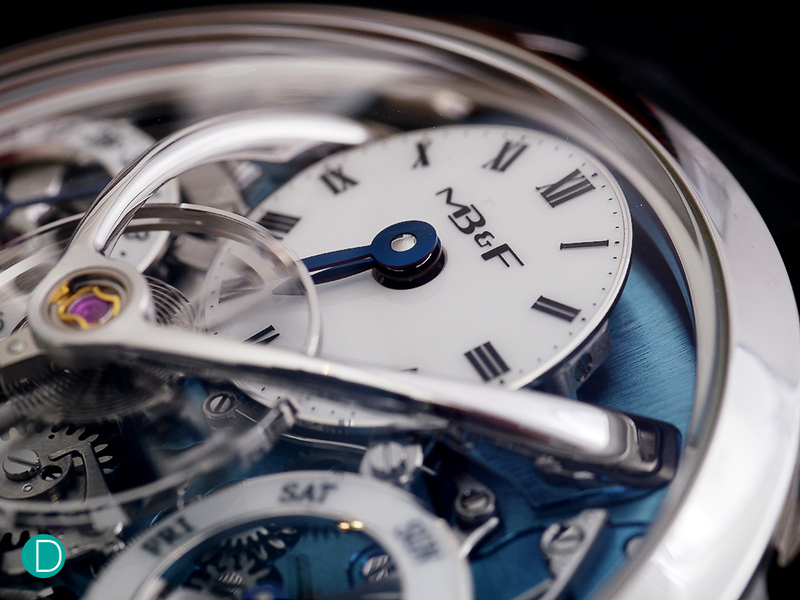 Enter the MB&F Perpetual Calendar. The grand levier is eliminated. To program the calendar display, MB&F uses a “mechanical processor” consisting of a set of discs. The processor takes the default number of days of the month as 28, and add extra days as required by each individual month. This ensures the display shows the correct calendar with no skipping over of redundant days. As the system is based on a planetary cam, it also allows quick setting of the year to correctly display the four year leap year cycle, while in a classical perpetual calendar, the entire 4 year disc needed to be scrolled through as the mechanism will not allow reversal of the year. To reach the next cycle, up to 47 months needed to be scrolled through. The MB&F LM Perpetual. The dial layout is clear and legible. Though there is significant more information to be display, it does so without looking cluttered. The earlier LM dials had negative space to play with, and the additional sub-dials for the perpetual calendar simply occupied these spaces. A 1920 x 1200 pixel wall paper Watchscape image is available for download by clicking on the following link. By clicking here, you may download and accept that the download is only for a free of charge license limited to the condition that it is only for personal, non-commercial use and that you will not modify the image in any way. The mechanical processor also allows the deletion of the grand levier which in turn allows for the MB&F signature balance to be suspended above the dial side. This would be impossible in a traditional perpetual calendar as the drive system for the suspended balance would interfere with the path of the grand levier. It also allows for the subdials which show the calendar indications to be designed in such a way that it appears to float above the complication with no apparent support from below. The calendar system begs comparison to the Moser Perpetual 1. The Moser calendar indications instantaneously jump at the stroke of midnight, but the LM Perpetual does so in the more classical dragging style. In both, the crown can be used to adjust all the displays simultaneously in the traditional sense at its first pull out position. The Moser crown allows the indicators to be adjusted in both directions, while the MB&F crown only adjusts the calendar displays forwards. Moving the hands backwards does not cause the calendar to reverse like in the Moser. We note that while turning the crown of the LM Perpetual backwards only moves the hour and minute hands backwards and does not reverse the calendar indicators, it is safe to do so. This is unlike the classical perpetual calendars, moving the hands backwards will not cause the movement to jam. The LM Perpetual also features an inbuilt safety feature that disconnects the quickset pushers during the date changeover, eliminating any risk of damage while the date is changing. The case band of the LM Perpetual showing the crown with the MB&F signature battle axe logo, and two of the four correctors to adjust the calendar indicators. To reverse the calendar indicators, for example when travelling from East to West and resetting the time to an earlier time is simple: reverse the time display, and correct via the 4 correctors on the case band. As a side note, in the Moser Perpetual 1, one simply reverses the hands, and the calendar indicators will jump backwards as well. 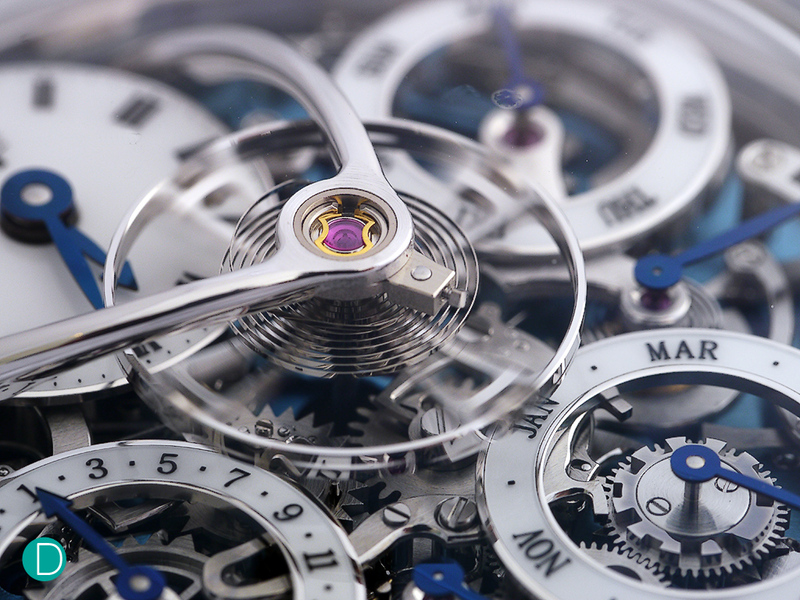 The movement of the LM Perpetual. 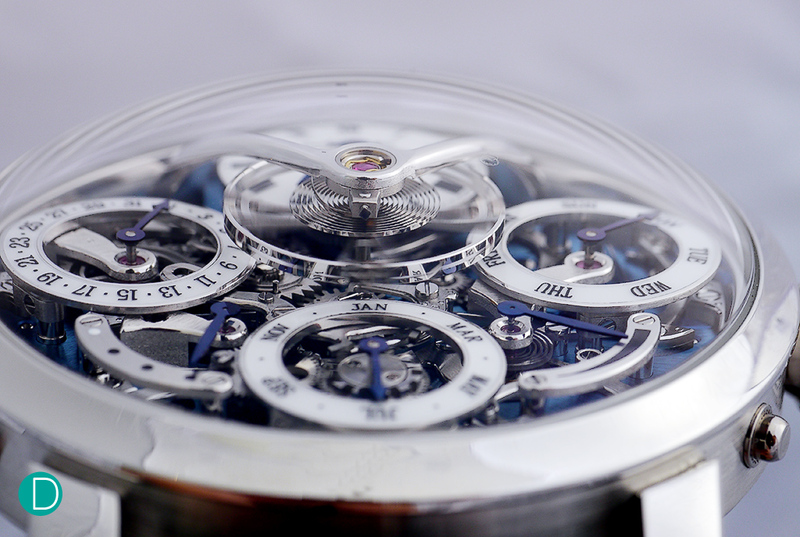 Beautifully laid out, and magnificently finished, the movement is a joy to behold. The concept and development of the mechanical processor controlled perpetual calendar was undertaken by MB&F friend Stephen McDonnell, who is a self taught movement designer based in Belfast, Ireland. He works from his own comprehensively equipped workshop, enabling him to make anything he needs for prototyping. Sounds like an interesting fellow for an In Conversation piece. We will try and arrange for that. Movement detail showing the beautiful finishing on the bridges. All the jewels are carried on the bridges using a gold chaton. A nice touch to classicism and very beautiful. Note also that on the bridge carrying the jewel for the pivot of the fourth wheel is cut such it has both an outward point and an inward curve hugs the jewel. The sharp outward point and the sharp inward point is very nicely executed. 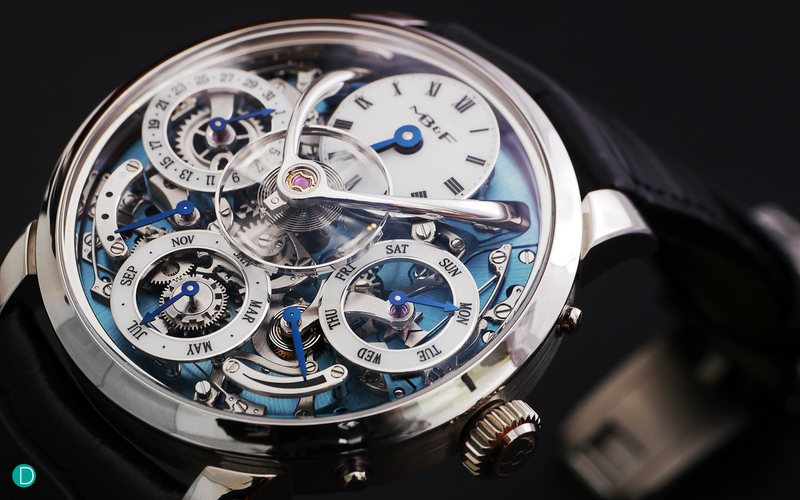 The use of a mechanical computer is of course by no means unique to MB&F. Greubel Forsey had introduced as their 7th Invention, a similar mechanical computer. 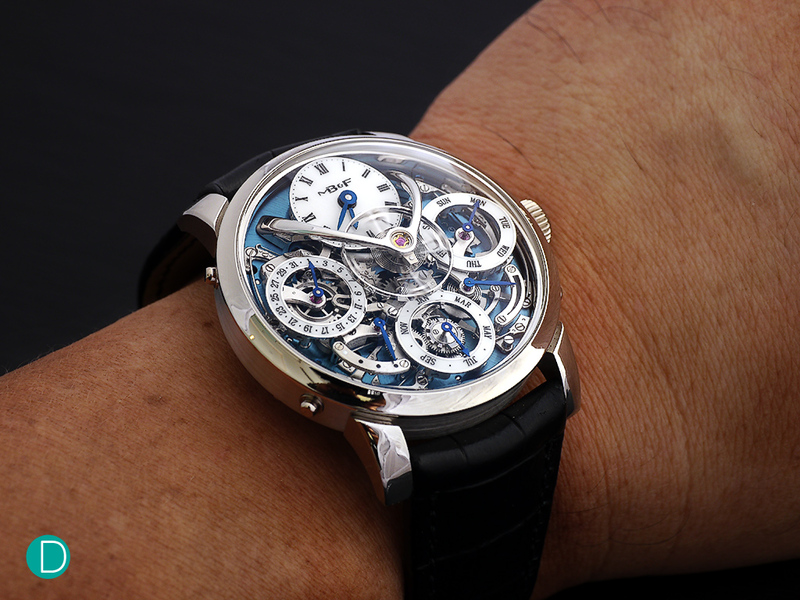 The first implementation is found in their Greubel Forsey Quantième Perpetual à Équation. Their Computeur Mécanique uses a similar system of a stack of discs which can be programmed to perform various functions. In Quantième Perpetual à Équation, it runs the perpetual calendar with equation of time display. We carried a write up of the watch here. We will continue to develop further thoughts on this magnificent piece: the MB&F Legacy Machine Perpetual. And for now, we will leave you with some concluding remarks on our first hands-on, physical encounter with the platinum version of the watch. The bridge for the suspended balance and the floating subdials makes an amazing visual impact. We were floored with the physical beauty of the piece. The combination of the domed crystal, and the curves of the balance wheel suspension bridge, though is a feature in the earlier LM series watches does not fail to impress. The color combination of blue and white is mesmerizing. The main time dial and calendar sub-dials, seeming to float above the blue dial is beautiful to look at. The design genius of Eric Giroud, who did the product design of the entire LM series is apparent. Detail of the balance wheel, suspended on its bridge, apparently beating on its own accord without connection to the movement train. Of course, this is just an illusion, the wheel is driven by the escapement wheel like all Swiss Anchor movements. The escape wheel, anchor and pallet system is on the reverse side of the movement. The beauty of the movement is undeniable. The innovative use of a mechanical processor to program the calendar is brilliant, though as mentioned not novel. As mentioned, Ulysse Nardin have eliminated the grand levier in their Perpetual Ludwig, annoucnded in 1996. The operational simplicity of the Moser Perpetual 1’s Flash Calendar system is more intellectually satisfying. 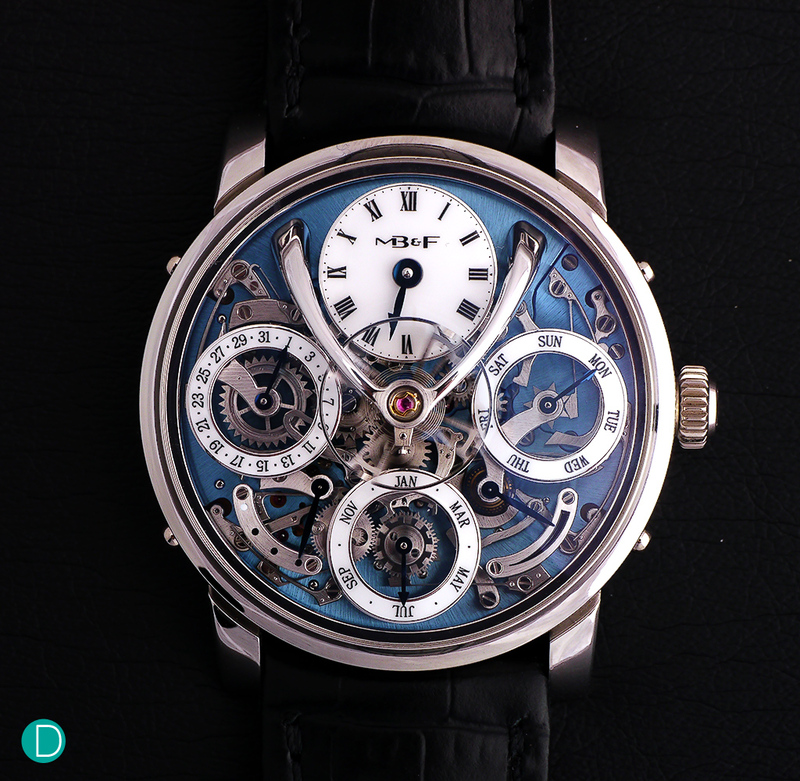 And Greubel Forsey offers a similar computer, though at a much higher price point. 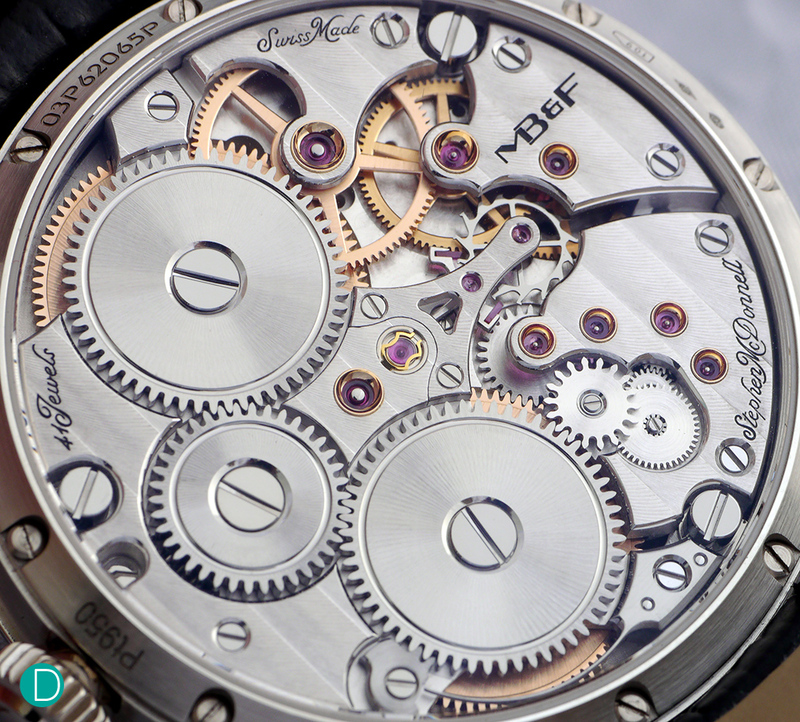 All these does not take away from the fact that the LM Perpetual movement is a work of genius. The LM Legacy movement. The escape wheel, anchor and pallet fork is visible at the center, as is the shock absorption system for the balance wheel. Finishing is impeccable. 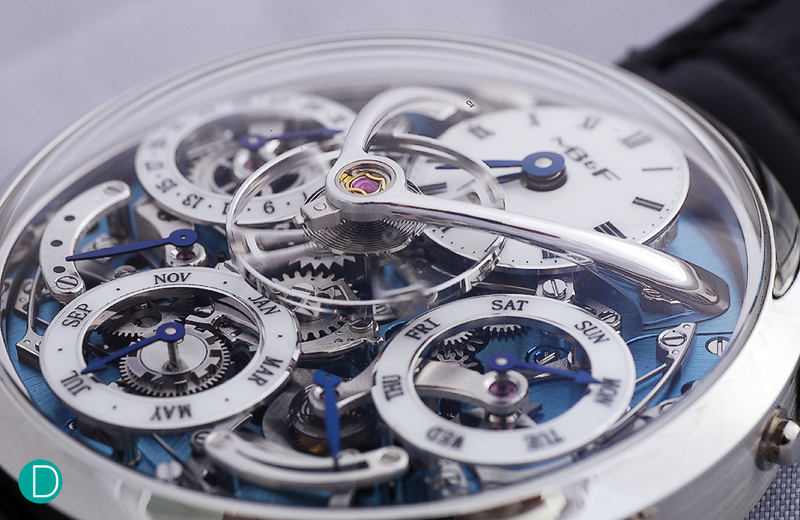 Every bit of the watch is as beautifully finished as it is conceived. All the traditional finnisage elements are very well addressed. Anglage, inward and outward points, Fausses Côtes or Côtes de Genève, chamfering of the openings holding the gold chatons for the jewels and polishing of every movement component is done par excellence. On the wrist, it feels superbly comfortable. Red gold – S$226,000, Platinum – S$275,100 inclusive of Singapore GST. with inbuilt safety mechanism. Manual winding with double mainspring barrels.